Womens' health tech brand Bellabeat announced a surprise hybrid smartwatch, the Bellabeat Time – but it has also launched the latest in its pretty unique series of Leaf trackers this year too. The Bellabeat Leaf Chakra is almost identical to its predecessors including the Leaf Urban, and the biggest recent changes have actually come via the addition of stress sensitivity to its already very comprehensive health and wellbeing platform. Priced at $139, it's going to set you back the price of a Fitbit Alta HR, but it does a better job of hiding away that tech compared to Fitbit's trackers. Bellabeat continues to impress with its ability to offer innovative features wrapped up in beautiful designs. The Leaf Chakra is a worthy Fitbit alternative but what features will convince you it's a better fit? Read on to find out just who will benefit from this nature-focused, fashion-friendly wearable, and who is best sticking to the big name fitness trackers. If you're familiar with Bellabeat, the Leaf Chakra's design won't surprise you. It's still… leaf shaped, quite lovely and it'll easily blend in to any outfit, more than a plasticky fitness band, but perhaps less so than a hybrid. I tend to wear these as a clip-on – on jumpers/dresses/pyjama pants – and if you wear it this way the difference here is that the Chakra will look more like a brooch than its predecessors, as there's more going on on top. That's because there's two models to choose from – the Leaf Chakra Love, which comes with a rose quartz stone plus silver finish, and the Leaf Chakra Power, which I tested, which comes with a black onyx stone and rose gold finish. *I won't be testing out the gemstones' respective powers in this review. Now, the Chakra is still fairly light but with one of those stones and at 19g it's slightly weightier than the 16.5g Leaf Urban – which is still on sale at a slightly cheaper price. That's not much of a difference in grams but it is in use. 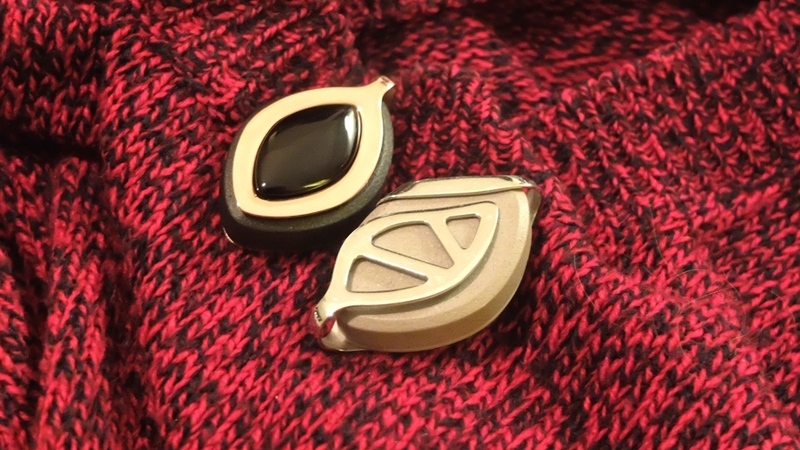 So if you plan to wear the Leaf as a pendant on the fairly dainty bundled Infinity necklace, as a bracelet with Bellabeat's accessory or clipped to a thin t-shirt rather than a thicker sweater or say a sports bra, I'd recommend going for the Leaf Urban instead. One last point on design – the Leaf Chakra's wood composite and stainless steel body is splashproof to IPX6, which is handy. The Leaf Chakra appears to be the new flagship of the Bellabeat line, but there are no exclusive features here (aside from a Seven Chakras option within Meditation). You get the same comprehensive – if slightly shallow – women's health and wellbeing platform. Within the easy to use Bellabeat companion app, for iOS and Android, you can set goals plus track activity (in minutes) and sleep via the three axis accelerometer. There's no additional heart rate or GPS tech here; it's kept pretty simple on purpose. In both cases, after we set our goals, the Leaf Chakra reliably tracked our basic day-to-day activity, displaying steps, miles and calories burned in the app once we synced it via a couple of taps. This is not a device to wear running, swimming or doing any activity you really want to track methodically, though, it's more a neat reminder to get 20 minutes walking or light exercise in a day and see your progress over time. It won't replace even a lifestyle-friendly Fitbit Versa, say, as the community and motivation aspects can't compete. Instead it will suit solo, casual beginners who care about being more in tune and improving their overall physical and mental wellbeing rather than PBs in races. For sleep tracking, it tracks sleep duration with how calm/restless it was and a five day average. You can add naps and it will check your previous night's sleep with you in the morning. It's basic but just good enough to be useful – again the likes of Fitbit are much more comprehensive with more useful insights than the ones that pop up here. On one occasion, I'd had the Leaf Chakra clipped to my pyjama pants and it didn't track the night's sleep at all – annoying but not a regular problem. You can also log litres of water drank – using Bellabeat's $89 Spring smart water bottle or more likely manually yourself – plus track the built-in meditation sessions (in minutes) and, the really nice touch, track your period, all in the same app, calendar view and homescreen. Bellabeat also gets bonus points for adding this years before Fitbit's female health tracking came onto the scene, and you can also export this info to things like Apple Health. The other big sell here is Bellabeat's stress sensitivity algorithms – these take into account your activity, sleep, menstrual cycle and meditation (if you're into that) and give you a stress sensitivity reading each morning in the form of a percentage and a graph. In practice, this can be a boost when it's positive but irritating when you're being told you're "sensitive to stress". If you forget to wear the Leaf for a few days, this can also really mess with the stress score as the system thinks you haven't exercised for days etc. You'll know pretty quickly if this is for you. There's not much in the way of extra features when it comes to the device itself, as you might expect. You can set an alarm but the vibrations are fairly gentle so be careful with that one. Battery life continues to get better in wearables with screens but we're still maxxing out at five to seven days. Bellabeat, meanwhile, runs its Leaf trackers on coin cell batteries meaning the battery will last up to six months between changes, depending on your usage. In the box you get a tool to unscrew the back of the Leaf when the time comes to swap a new coin cell in. After using our Leaf Chakra on and off for a month, it's still on full battery according to the companion app. That's no small consideration, especially if you're happy with a passive tracker that you sync to your phone at the end of the day rather than one you're checking constantly. Still genuinely different to any other health and fitness tracker, the Bellabeat Leaf Chakra adds natural stones to the mix and presses on with its activity, sleep, period and stress sensitivity tracking platform designed with women in mind. Certainly not for everyone but worth a look if you're more into meditation than PBs.